Are you looking for a high-quality, guided, 15 minute mindfulness meditation? Below, we hope you’ll find exactly what you’re looking for. We’ve created a 15 Minute Mindfulness Meditation video that you can use right now for relaxation, reducing anxiety, and cultivating peace of mind and insight. Also, you’ll receive an MP3 version of this 15 minute guided meditation – which you can download and use any time you like – when you subscribe to The Mindfulness Edge e-mail list. Below the video, you’ll find a description of this guided mindfulness meditation, as well as some tips for how to best use the meditation. This 15 minute mindfulness meditation begins with pure mindfulness. You’ll be guided to waking up to the pure, knowing awareness of mindfulness. The practice is essentially effortless. Being mindful means that you are the awareness that knows experience, without being identified with thoughts and emotions. The moment you recognize your posture, you’ll find that you are being mindful. It’s as though you are effortlessly observing yourself sitting (or in whatever posture you may be in). With true mindfulness meditation, you’re not putting a lot of effort in to focusing on the breath, or anything else. You simply know that you are sitting and breathing. The breath can serve as a timer for you. The only goal during this 15 minute guided mindfulness meditation is to have a curious, knowing awareness of what is happening now for the duration of one in-breath. And then again for one out-breath. It’s just one breath at a time. The guided mindfulness meditation then deepens your awareness of the body by helping you practice sweeping through the body with awareness. This mindfulness practice is often referred to as a body scan. While practicing mindfulness of the body, you’ll be guided on how to deal with thoughts and anything else that you might find distracting. After sweeping through the body with mindful awareness, you’ll find that you are much more aware of the body, and you’ll likely feel more relaxed. With this relaxed body, you’ll practice simply resting in the knowing awareness that is mindfulness, becoming more familiar with what it is like to be your true self, to be free. Thoughts will surely arise. But you’ll be guided on how to see thoughts as welcome friends that help you cultivate insight into the truth that your thoughts are not you. Thoughts are simply objects that arise and pass away in the mind according to various causes and conditions. This insight into the not-self nature of thoughts is what helps you to gradually become completely free from your thinking, able to use thoughts we deem as useful and not be controlled by thoughts that do not serve you. For the duration of the guided mindfulness meditation, you’ll experience longer periods of silence and less guidance. You’ll notice that there is relaxing, beautiful music in the background of this guided meditation that is just loud enough to be audible, but not distracting. You’ll also noted the narrator, mindfulness speaker and author Matt Tenney, uses a very natural voice that makes it very easy to listen to the guidance he offers without being distracted by an unnatural voice. He was actually doing the practice while this guided mindfulness meditation was recorded. Ultimately, mindfulness meditation is very, very simple. The moment you realize that you’ve been thinking, you’re being perfectly mindful. Mindfulness can be realized at any time, in any posture. For this guided mindfulness meditation, we suggest that you practice while sitting in a place where no one will demand your attention, and where it’s safe for you to close your eyes, relax, and potentially even fall asleep. You don’t need to sit in any special posture. Just sitting in a chair or even on the edge of your bed is fine. We do recommend that you sit with “good” posture. If you slouch, you’ll likely feel drowsy and you won’t get as much out of this relaxing guided meditation as you will if you sit with “good” posture. You’ll probably be more comfortable if your feet are flat on the ground. You can practice mindfulness during this guided meditation either with your eyes open or closed. There are benefits to both. Practicing with eyes open can be helpful if you’re drowsy. It is also helpful if your mind is very busy with thoughts. Seeing your surroundings can help prevent you from getting pulled into thoughts. If you practice with your eyes open during this guided mindfulness meditation, you should try to hold you gaze study. You don’t need to focus on any particular object. Just try not to look all around. Practicing with the eyes closed can be very restful. Also, practicing mindfulness with the eyes closed can help you to see your inner world a little more clearly. The goal of this meditation is to simply be aware of whatever is arising in consciousness in the present moment. Although the idea of doing this for 15 minutes straight might seem a little daunting, you don’t need to maintain mindfulness for 15 minutes. Your goal should be to maintain mindfulness for one in-breath, and then do it again for one out-breath. It’s just one breath at a time. It doesn’t matter what arises in consciousness. There could be sounds, physical sensations, good thoughts, bad thoughts, pleasant emotions, and unpleasant emotions. Your job is to simply recognize whatever is there, and allow it to be there exactly as it is. Your job is to be both courageous – recognizing and turning toward whatever arises – and kind – allowing whatever arises to be there as long as it needs to be. Again, you don’t need to do this for some long period of time. Just take it one breath at a time. Did you enjoy this 15-minute guided mindfulness meditation? 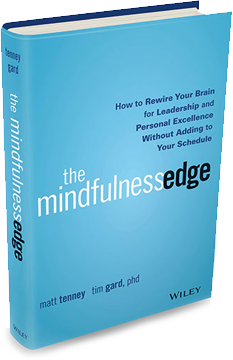 Then you’ll probably love some sample chapters from the highly-acclaimed mindful leadership book, The Mindfulness Edge: How to Rewire Your Brain for Leadership and Personal Excellence Without Adding to Your Schedule. Click here to receive 2 of our favorite chapters from The Mindfulness Edge, for FREE! You’ll also receive our newsletter, so you never miss a new article or video. Matt Tenney is the Chief People Officer of The Generous Group, and the co-author of the book The Mindfulness Edge: How to Rewire Your Brain for Leadership and Personal Excellence Without Adding to Your Schedule. He is frequently invited to provide keynotes and training on leadership by Fortune 500 companies and other recognized brands.